Firstly, I’d like to say a huge heartfelt thank you to everyone who has supported this Kickstarter project. I’ve had a whirlwind of a weekend with my inbox literally breaking with messages of support from fans of the Super Famicom and who share a love for the games. Thanks to the journalists who got in touch, the websites that celebrated the book and its games, the broadcasters, even the indie film makers! And all the cool kids who still love to rock their SFCs! It’s amazing to speak to lots of retro gamers who love these games as much as I do – after all, that’s why I started this project. I LOVE collecting and playing them and always have - since the early 90s. It’s a labour of love for me and seeing the book coming together is just amazing. It’s such a cool little book, and looking at what has taken me the best part of two years to conceptualise, photograph and design is very exciting. It was to be a gamers visual guide and a memento for a console that’s long gone, with a hand-picked selection of some of the best and the rarest games that not many gamers would have seen before. The forewords and contributions are especially fantastic, particularly Masaaki Enami’s story of playing them as a kid in Tokyo. His store of Nintendo clothing is testament to how much he loves the Super Famicom and how much it meant to him playing them. I started this project after speaking with friends with colleagues in Japan, who work within the games industry and by looking at copyright here in the UK with regard to derivative and non-derivate copyright photography and how it differentiates in each country. Japan has two types of copyright, author’s and neighbouring and each is different. They also have a software copyright law that (on the gaming side) is focused more on the ill-use of screenshots and captured footage of games – particularly footage used on commercially based platforms, such as monetised YouTube channels and websites. After speaking with the guys I know in Japan as, well as contacting Nintendo Europe, I’m still no further in the minefield of international copyright. I thought I had enough clarity with copyright, especially when I had people supporting my own research, So it’s with great sadness that I have to announce that I’ll be closing the Kickstarter pledge. I’ll be completing the book as planned and I will spend the next few months finding the VG publishers who are left to seek permission. I’ve had offers from some publishers who have taken a keen interest in the book outside of Kickstarter and hopefully my book will reach you that way. I wanted to try and give an example of how copyright works with older video game packaging, it’s not as clear-cut as you might think and the unfortunately the internet doesn’t provide all the answers to a layman. The artists behind these games were part of little development teams but the publishers were the names responsible for copyright. One of my all-time favourite Japanese games, Gourmet Sentai Bara Yarou was published by Virgin Interactive – a British-based video game publisher. They were also the publishers behind the legendary Japanese SFC title Rendering Ranger R2, by Turrican’s Manfred Trenz. The publisher switched hands a couple of times and eventually was put into liquidation in Spain with its last owner, resulting with its assets and IP absorbed by creditors. In other words, no one owns it any more. They are essentially lost forever. My attempt with the book was to try and at least archive them, just like comic collectors, baseball card fans or collectors of guitars do, before they do vanish into thumbnails on a Google image search. One book that was influential on this project, ‘Bass culture: a guitar collection by John Entwistle’ contains a huge collection of crazy and weird guitars from the bass player of The Who. His book omits credits on some guitars and didn’t have copyright clearance on every page as they weren’t able to track down every copyright owner, due to their obscurity. It’s the same case with some of these games, unfortunately. I could let this project run to its deadline and it most likely would have met its goal. The books would have been printed and each of them would have been posted out to all of you, but not every game (especially the rarest titles) within the book would have been had copyright clearance, certainly not in the time I would have within 3 weeks. I wanted to have the book on the press straight after our deadline was met. I wasn’t in this for the money, the quantity cap and profit-margin are proof of that. I was doing it for the gamers and the collectors out there, just like me. Our good friend Stu Brett — otherwise known as Super Famicom Guy — has recently launched a Kickstarter which we can honestly say has excited everyone here at Nintendo Life towers, being the massive 16-bit fan boys that we are. This stylishly presented art book sets out to display some of the best Super Famicom (the Japanese name for the SNES, in case you were wondering) box art covers from Stu's personal collection. "The book is a real labour of love for me as I only collect Super Famicom games," Brett tells us. "It's the one games console of my youth that had the greatest influence on my gaming, and judging by the reaction on Kickstarter, the games were and still are hugely popular with people of all ages. The support from the gaming community has been amazing and I can't wait to share the book with fans if it reaches its goal." When replication artwork in such a fashion there are legal issues to consider, but Brett insists that there won't be any problems should the book reach its funding goal. "I've spoken with contacts in Japan with regard to copyright via a friend, who works In the industry and lives there," he explains. "He was relaxed about the matter saying that photography from items I own is not an issue. Screenshots and footage of games on commercial platforms is more suspect to copyright infringement in Japan but I've yet to hear of anyone who has a monetised YouTube channel or website being warned. I've been double-checking with others and I've emailed Nintendo as a courtesy. The advice from people I know in Japan is to go ahead, but I'm still in investigating the matter to be sure." At the time of writing the Kickstarter is well on its way to making the goal of £27,000 — in fact, it's had more than £18,000 worth of pledges already. This spiffy looking art book is limited to only 1,125 copies and the pledges are coming in thick and fast. If you wish to secure a copy you might not want to leave it too much longer to back this awesome looking project. Being a gamer shaped by the NES, SNES and N64, and being, probably, the SNES the best out of these three, it needs as much of this as it can gets. I'd love to see this out there... and in here, of course. The SNES was - and is - one of the greatest consoles of all times. It deserves this. We deserve this. I wish Nintendo would release some cool history books. That would be even better. I was all set for kickstarting this but checked wikipedia and discovered there were "784 official releases, 251 were exclusive to North America and 63 to Europe" this book only has 204 pages so either there is gonna be lots of thumbnail images or quite a few games won't be included. I'm not interested personally, but it's a great idea and the book has a very clean and detailed look. I would certainly want it if I were old and Japanese enough to better appreciate the SFC! I do enjoy a good piece of box art. Looks polished enough and is definitely a book I could see myself owning. I would like to see the back of the boxes too, not just the front. As it stands, this doesn't really appeal to me. Don't really see the need for this, but cool for those who like these kinds of books! I would love to see a Commodore 64 box art version of this book. All we had to judge games on in the 80s was box art and some of the box art was genius. I used to buy cassettes with a cool alien picture on the front and get home to find I had bought a choose your own adventure book that didn't feature aliens. 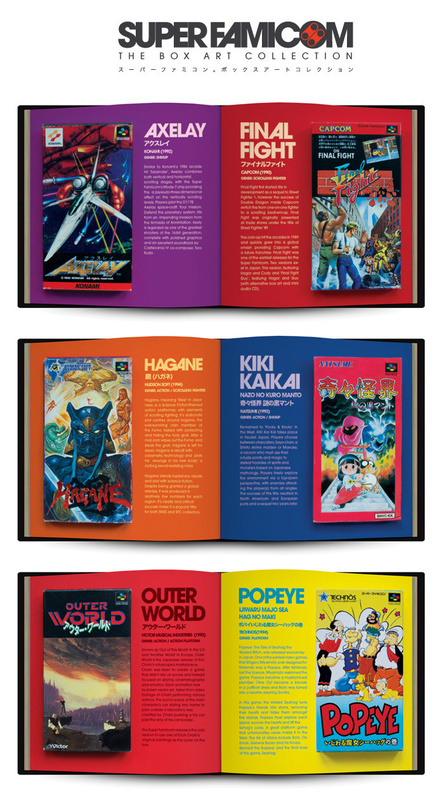 I'm remind of a Japanese book of the Famicom (ファミリーコンピュータ 1983-1994) which contains photos of every game box and cart and a description in English and Japanese and some interviews (again bilingual). For a lot of the minor games it does cram several into a page (well how else do you fit 1252 games into 199 pages). I might try to get it one day, but it is long out of print and it looks like I'll have to use a mail forwarding company making it pricey. 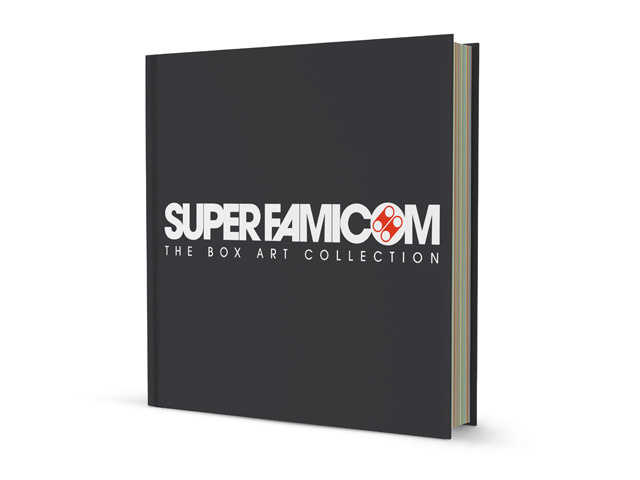 @gspro15198 Given how it says "celebrates the Super Famicom's greatest games and box art, from obscurities to classics" suggests it is curated selection. As for "I hope it will bring new fans to the 24 year-old console and its Japanese roots". Limiting it kind of defeats the purpose here. My friend and I just pledged. Thanks for bringing it to my attention! great now were going to have to get rid of all of our sfc game boxes to make room for the book that has pictures of the previously thrown away boxes in it! And we were so much better off for it. Ah, the good ol' days! ah, i see im not the only one who has gourmet sentai bara yarou.